South Shields is a place I have only started visiting in the last few years. 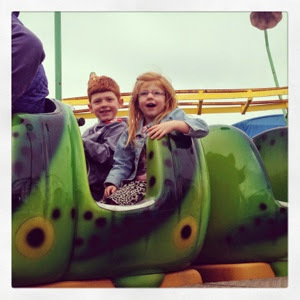 It is such a great place to visit for families on a budget and a place we will probably go more often now that I have discovered all that it has to offer. We parked our car next to Ocean Beach pleasure ground which was a very reasonable £3 per day (and can be transferred to other Council car parks). 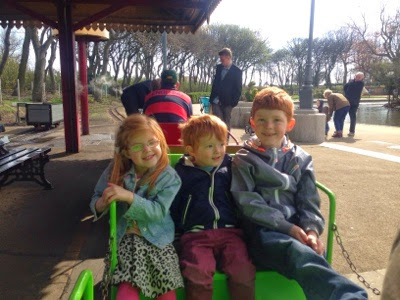 Our morning was spent in the lovely South Marine park which is just across the road from the sea front. It is a large park and the type of park you can spend all day. 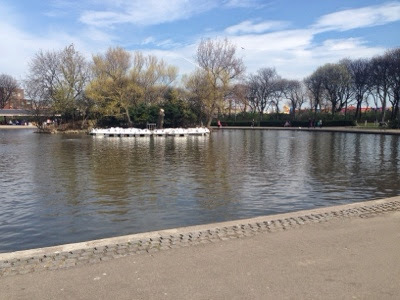 There are large grassy areas to enjoy picnics or ball games, a large boating lake where you can feed the ducks or hire a boat and a special art trail to follow which features 10 sculptures reflecting the park's heritage. 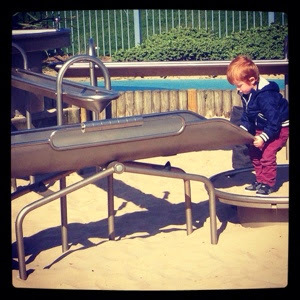 There are two fun playparks next to each other which are aimed at pre-schoolers and older children. 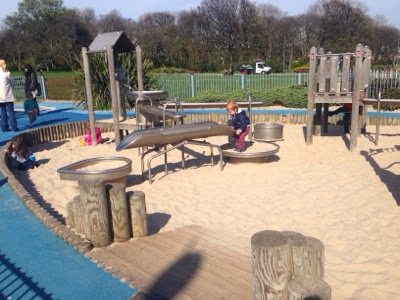 Our 3 year old loves this park and in particular the sand area where he can move equipment to dig and move sand. 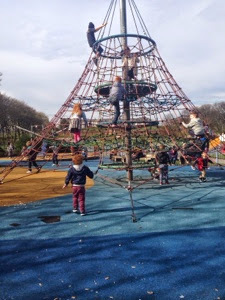 Whilst our older children love the challenge of climbing to the top of this net. 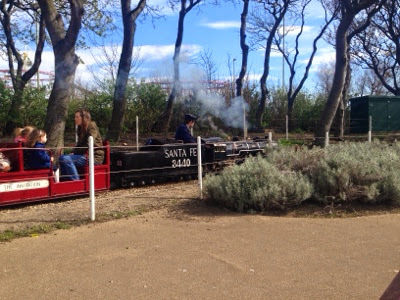 There is a cute miniature railway that travels around the park and it only costs £1.20 per person per journey. We could not resist a ride and loved our little journey around the lake. There is a nice cafe by the lake in this park too with lots of outdoor seating where you can enjoy a drink/snack whilst enjoying the view. En-route there are skate parks, basket ball courts and mini golf to enjoy or you can just take in the view. Once you get past the dunes, the beach is lovely and sheltered and always popular with families. 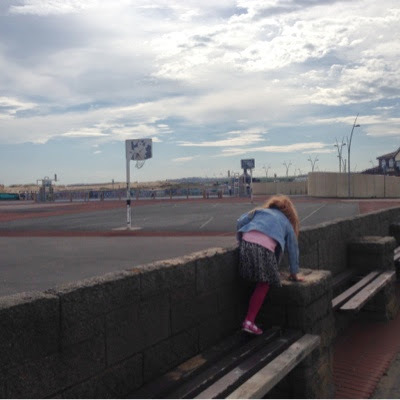 You can also walk the other way along the prom (towards North Shields) where you will see fantastic views of Tynemouth priory and there are some rock pools on this part of the beach to explore. 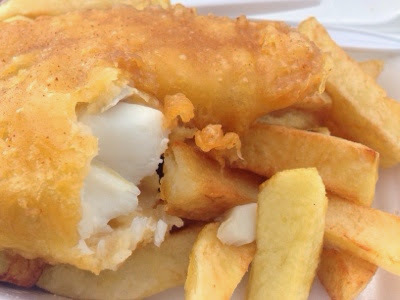 A trip to the seaside is not complete without some fish and chips and you are spoilt for choice in South Shields (home of award winning Coleman's). We bought some right in the sea front from inside Ocean Beach and they really hit the spot. 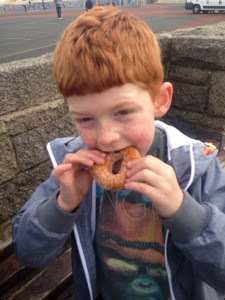 We ended our day sharing a bag of freshly made doughnuts from one of the fairground stalls. It was just too hard to resist as their smell is just so enticing! 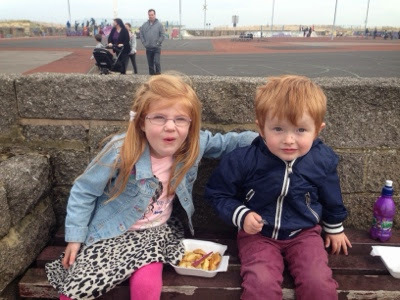 We enjoyed a fantastic day at South Shields. 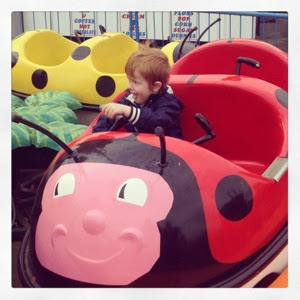 There is just so much to do and we found everything to offer such fantastic value for money. 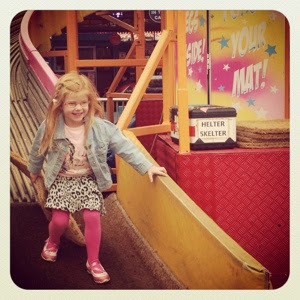 Have you been to South Shields? Where are your favourite spots?